Way better and way more accurate than "Assymetrical 4X". It's an RPG game in a 4X, through and through. Ditto. But i think they can still salvage the "Assymetrical 4X" idea if/when they get the balnce right. Doomsday counter never reallly comes into play. People are caught up in the hype of popular titles. I know cause my brother plays war thunder all day, well I let him try sorcerer king and he didn't think it would be good, and played for 2 days until he had to go back home. I know sorcerer king has a lot to offer to many people who just don't know it yet and they have no idea. Including me I wasn't sure at first either, I was not sucked into this game by the marketing I bought it cause of fallen enchantress. So here's some marketing idea's i'll throw out. Hope this helps sorcerer king really take off. * People have no idea what features are actually in this game or the depth of this game. - I had no idea crafting could be enchanted, I had no idea how diplomacy worked or if it was there. * Diplomacy as well is prolly one of stardock games strongest features the political features. And nobody really see's it. At least I didn't. * People need a reason to drop 40 bucks on this game and the only thing that is gonna ensure them to at least try it is to let people know how you came from elemental to fallen enchantress take pride in the fact you over came a hardship that company's like EA or Ubisoft would have never done. People are mad at AAA titles. * Last marketing idea, you should allow people to try the game. Everyone jumps on free to play games cause they are free, and a free to play weekend. * Other than that someone make lets plays. 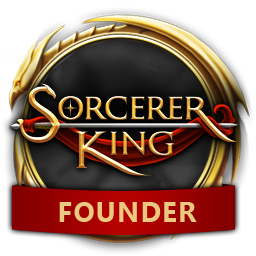 * Oh and let people know in a very short detailed manner what is to come for sorcerer king and why it's unique compared to other games and why people should trust your name. I was not sucked into this game by the marketing I bought it cause of fallen enchantress. how this game got titled "sorcerer king" is beyond me; imo "elemental: forge of the overlord" or something of the like is much more appealing. too late now, although i would still incorporate the "elemental" monicker into "sorcerer king" somewhere..
as far as i can tell at least half of the fantastic strategy game playing demographic is Eastern European. my original trolling around strategy game boards regarding fe instigated many conversations and received thousands of views..
although now the genre is much more saturated than it was then, and in the face of aow, endless, m&m, and kings bounty, i really think sd needs to distinguish the elemental brand to compete. just fun food for thought. You have a point aow, endless, m&m, and ect really are a competing force. aow3 is prolly gonna just win, but m&m is a ubisoft title and they are pushing the game out for money, don't worry about that pile of junk only thing that's gonna save it would be the devs. replace the softpedia review on the steam page with the rockpapershotgun one! "fallen enchantress / legendary heroes is a strategy game - you manage an empire against other empires. although sorcerer king is also a strategy game, it plays more like an rpg - you manage parties on a quest to save the world." perhaps this faq from the eador site explains it? "Why strategy games are such a big deal in the Eastern Europe? For some reason, Eastern Europeans really like strategy games. Especially the military ones, about conquering the world and suppressing the enemies. We don’t know for sure, but it seems that we’re big fans of the iron authority here and strategy games are the easiest (and usually safest) way to feel that kind of power in your own hands. Well, at least this is the one of the theories." For some reason SK didn't take off. Maybe folks were unhappy with LH, and see SK as one too many sequels- it's Ultra Elemental Super Hyper EX Turbo plus Alpha to most folks I know. As much as I love SK, I'd understand if Stardock wrote it off, and tried a sequel in 5 years instead. I'd love to see the modern Stardock design in the Elemental world from scratch instead of dealing with the relic code and reception of War of Magic. i think this is mostly a matter of branding and marketing - instead of owning the elemental series's spotted past (and embracing its admirable comeback), and creating a "family" of games that compliment each other and connect into one overarching story, sd has consistently opted for an iterative approach that renders the previous game as both obsolete and as self-competition. lh 2.0 is quite solid. i just really wish the enchantress and the king would stop fighting for my affection. pokemon red and blue didnt when i was younger: they were practically the same game and i wanted to play them both, simply because of how they were branded and integrated. i feel like its going to take another elemental game on a new engine to finally see the results of this great open development experiment that the series has been thus far. honestly; interacting with the devs and community in contribution to the development of the game(s) has been just as much fun as playing them (although the devs have been slacking in communicating with the community lately imo).